Pollo al mattone, which I would translate roughly as “chicken under a brick”, is an ingenuous way of grilling chicken. The bird is butterflied, flattened and weighed down so it cooks quickly and evenly over hot embers. It sounds astonishingly simple—and it is—but by some sort of sorcery I can’t explain, this technique really does make a huge difference, producing wonderfully juicy meat and crispy skin. In fact, I would venture to say this may be the most delicious way to grill chicken there is. One young chicken such as a ‘fryer’. Heat your grill until it’s very hot and grease the grates well with oil. Place the chicken on the grill, skin side down. 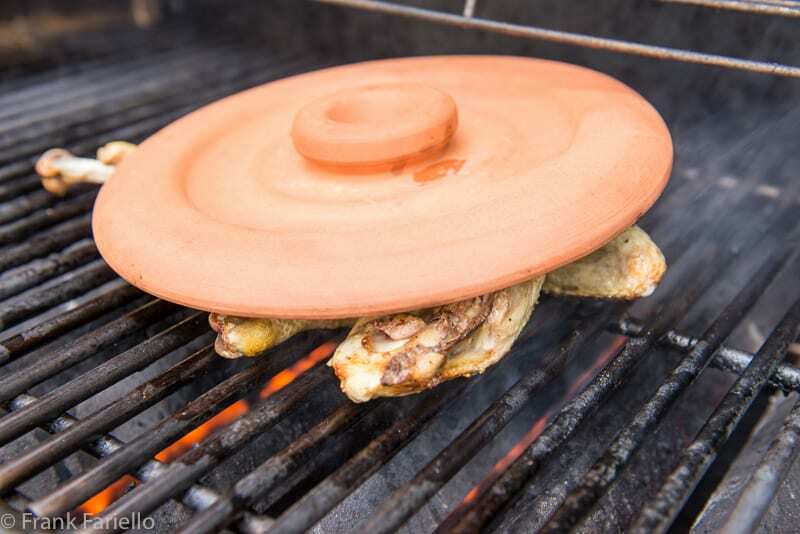 Weigh the chicken down, either with the special purpose round terracotta press pictured below, or with a cast iron skillet covered in foil, or—if you want to be really traditional—with one or more bricks covered in foil. Grill the chicken until golden brown on both sides, turning it rather more than halfway though the cooking time. This should take about 30-45 minutes for a smaller to medium-sized chicken. Test the chicken for doneness by pricking the thigh with a skewer or knife; the juice should run clear, with no trace of pink. Let the chicken rest for 10-15 minutes before cutting it into pieces and serving. A mentioned, the eponymous mattone (Italian for brick) can be an actual brick. Or several, since your average brick will cover only half an average chicken. But an easier solution is a special purpose heavy, round terracotta press, usually sold along with a plate underneath, large enough to cover most chickens entirely. The plate can be used as a kind of griddle to cook the chicken on the stovetop or in the oven, or even on the grill if you prefer. (Unfortunately, I’m not sure the press sold in the US; a quick Amazon and Google search came up dry.) Otherwise, a heavy flat object like a cast iron skillet will do nicely. For sanitary purposes (and to avoid dirtying them) it is prudent to cover the brick or skillet with aluminum foil. Spatchcocking a chicken works best with very young chickens—the bones are tender enough to cut through and crack with ease. If you’re opening an older bird, you may need a cleaver. 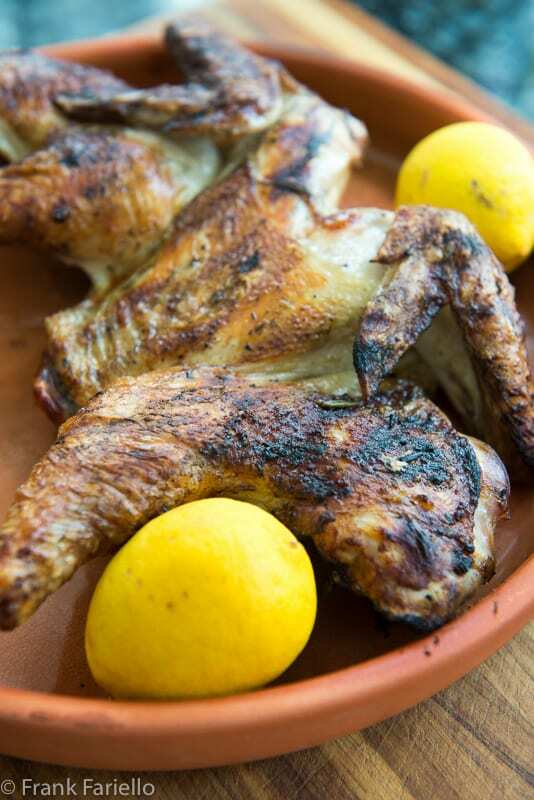 In any event, you want a young chicken for this dish, as this kind of direct heat grilling really needs a tender bird. As always, a free-range bird will provide better flavor. And unless you really love the breast meat, I would avoid those chickens raised for swollen breasts, so common here in the US these days. They tend to cook too unevenly, as those “Dolly Parton” breasts don’t allow the bird to flatten out properly. If don’t have an outdoor grill or the weather is not cooperating, you can make pollo al mattone on your stovetop or oven. For the stovetop, get a griddle or cast iron skillet really hot, then simply proceed as if you were cooking on the grill, laying down the chicken skin side down to start, weighing the chicken down as directed above, and turning it over after 15-20 minutes. For the oven roasted version, use a cast iron skillet to start as if you were cooking on the stovetop, then once you’ve weighed the chicken down, transfer it to a hot (200C/400F) oven and roast for 30 minutes or so. No need to turn it as it roasts. I like the simple marinade presented here best for my pollo al mattone, but it’s really up to you. Some recipes call for minced onion rather than the garlic. Some add a bit of peperoncino for spice. In fact, the marinade used for another Tuscan grilled chicken dish, pollo alla diavola, would work quite nicely here, too. If you wanted to be a bit “adventurous”, I reckon some Spanish paprika would add a pleasant if unorthodox smokiness to the dish. The essence of the dish is in the weighing down of the bird, the marinade (at least in my humble opinion) is secondary. In fact, some recipes don’t call for any marinade at all, just a good sprinting of salt and pepper before grilling. I would, however, avoid American style ketchup-based marinades, which would get very messy. One young chicken such as a 'fryer'. 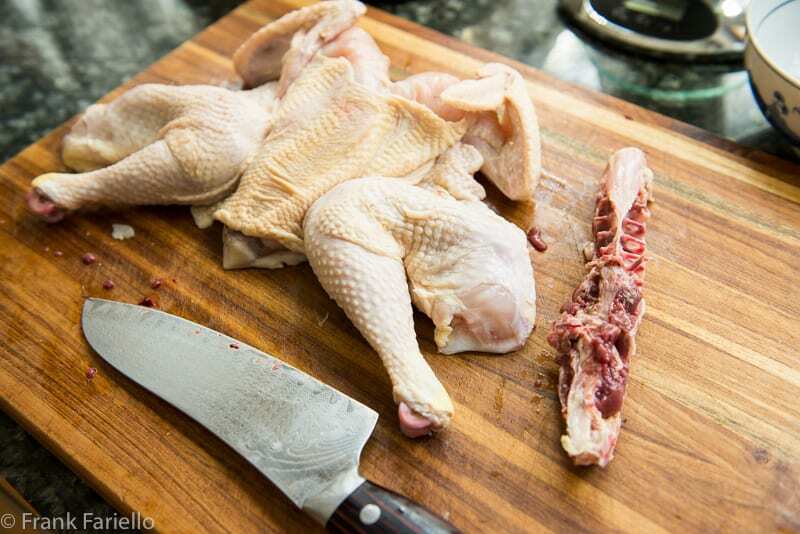 First, spatchcock the chicken by cutting out and removing its backbone, then opening the bird and flattening it out. Lay the chicken in a large bowl or baking dish. Mix the marinade ingredients and pour the mixture over the chicken, making sure it's well covered top and bottom. Marinate for at least an hour, or as long as overnight. Heat your grill until it's very hot and grease the grates well with oil. Place the chicken on the grill, skin side down. Weigh the chicken down with the special purpose round terracotta mattone, cast iron skillet, or one or more bricks covered in foil. Grill the chicken until golden brown on both sides. This should take about 30-45 minutes for a smaller to medium-sized chicken. Turn the chicken over, breast-side up. Using the back of a skillet or meat pounder or just your hands, press down on the breast until you hear the breast bone crack. Continue to flatten out the chicken as much as you can. I do this. I love this. And yes, we use a brick. One of my favorite ways to prepare a whole chicken as well. I have two bricks set aside which, as you explain, I cover with foil. The resulting chicken is crisp and juicy but yours looks especially delictable. After seeing your delicious looking chicken under a brick, I’ll have to give it another go. The one and only time I tried it, I totally massacred it. Sorry to hear it, Linda. But it is worth another try! We tried to spatchcock chicken from the breast side in the past, but your backbone method sounds a lot better actually! We’ll definitely give this a try soon! Next time I’m going to try the breast-side, just to see the difference. sono certa che con questo sistema il pollo risulto buonissimo, non resta che provare ! I think Stefano is taking something from the very top end of the market, a good quality free range chicken can be had in the UK for less than half the price he quotes. For example these excellent birds, produced locally http://lane-produce.weebly.com/our-chickens.html come in at £5.50 ($7) a kilo (£2.50/$3.25 a lb). It so happened I had one in the fridge and a new tank of gas for the grill (I prefer gas with lava rock for grilling) so I cooked this yesterday (no flare-ups). It was good but rather dry so I would recommend starting out with 10 minutes per side, then testing with a digital temp probe. After 15 minutes a side, mine was well over the 75C (165F) mark so start with 10 minutes a side and if it hasn’t reached the safe temperature then give it a few more minutes, turning frequently and testing, until it does. The idea that in the UK organic is somehow ‘better’ than free-range and bio-dynamic ‘better’ than organic is a myth. What makes the difference is how good the farmer is and how careful she is in sourcing her chicks. Stefano perhaps needs to get a better butcher. Thanks, Frank. I will give that a try. Out here in the desert, charcoal grills are frowned upon, but the Kamodo is the one I would want! Right now, with my work schedule, I like the speed of the gas grill… maybe when I retire I will do charcoal wood! you are right, there is hardly a recipe better than this one for grilled chicken! It so bring me back to childhood, that wonderful mixture of charcoal and rosemary, a perfect summer dinner! Glad I could bring back those memories, Letizia. Thanks for your comment! Nice recipe Frank. I flavor the chicken with some chili pepper. It gives a tasty flavor. So true, Paola. Thanks for stopping by! One of these days I have to grill a chicken like this, yours looks delicious. Do give it a go, Gerlinde. I bet you would like it! I’ve never made chicken this way, although I’ve had it and you’re right — it’s really good. I often spatchcock chicken (and turkey) so I really should give this a try. Thanks! Definitely worth a try, John! And I have to give a spatchcocked turkey a try—that sounds like quite the project. I too am interested in any info about using a gas grill. If I put mine on high heat, it quickly gets up to 600°F, which would carbonize the bird in no time. Does you grill have a thermometer on the cover? I usually cook chicken at it’s lowest setting, an only use the two outside burners (of three) to prevent flare-ups. I have some flat paving bricks around here that should work great. Also, a good set of poultry shears makes it east to flay the chicken – I often make pollo alla diavola, and like you, I too prefer to cut out the backbone. Lava rock is a highly effective heat diffuser and gets rid of many of the problems of ‘naked’ gas grills. I listen to the food cooking to tell me whether or not the heat is too high. Another simple, yet brilliant classic recipe. 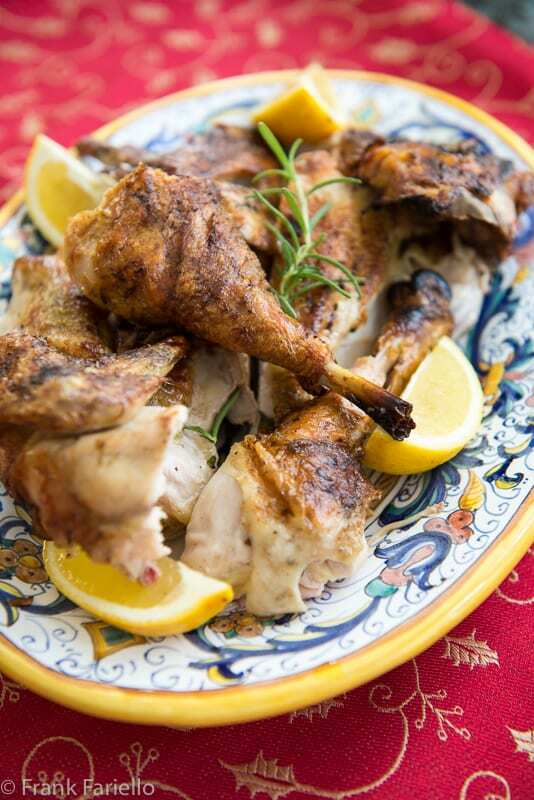 The lemon and rosemary marinade is my favorite way to make chicken, but I usually roast it. We really need to use our grill more often, and we use charcoal, and not gas, so it’d be great! This brings about one of the negative aspects of the gas grill. This kind of dish is definitely better over coals (gas grills, I assume, would have too many flare-ups), but I want to give it a try. Have you done this on a gas grill, Frank? Any advice? The oven version sounds good, too, but misses out on the grilled flavor. And to Stefano’s point, I can get an organic, free-range chicken at our market for about $20. Not as bad as in Britain. I can also get organic (not free-range) at the grocer’s for about $12-$15. Alas, I have to make do with a gas grill. I’ve been wanting to replace it with a charcoal grill for some time now. I just haven’t decided what I want to get, a kamodo, a conventional kettle or perhaps that new hybrid that Weber has come out with… any suggestions? Having said that, I do get acceptable results from my gas grill using the technique I mentioned to chiaroscuro. I just checked again, just in case I had said a piece of nonsense: my local, good butcher sell organic chick at £ 24.75 . in the UK organic should be superior to free range, the top then being biodynamic (raised according to Steiner’s ideas). I’m glad the recipe didn’t involve throwing a brick at a live chicken. Here in Québec I can get an organic chicken for about half what Stefano is paying in the UK, but it won’t be a very big one. I don’t know the Portuguese style… will have to check it out. I agree that chicken under a brick produces the most amazing chicken. We’ve been butterflying (spatchcocking) the chicken for years. It is a great way to grill chicken. Instead of brick, we use a heavy cast iron skillet to weigh the bird down but our skillet does double duty –we roast potatoes at the same time. In fact, we’re planning on just this recipe on Sunday. Buon weekend, Frank. That’s a neat trick, Marisa Franca. I’ll have to keep that in mind for next time! Now that’s what I call multitasking! I bought a mattone years ago and the top ended up breaking. So now I just use a skillet, and I bought a really heavy metal weight to hold down the chicken. Love the marinade. Sorry to hear, that Mimi. Your new method does sound just as effective, though. spatchcocking a chicken is I think one of the best way to eat it. I tend to salt it the day before and then leave to dry out in the fridge – this, for me, makes for the tastiest meat. Here in the Uk is a good chick is nowadays very expensive: u r looking at about 25 pounds, for an organic chicken from a good independent butcher. is it the same in the US?